I call Sye Ten Bruggencate friend and brother, while I have never yet physically met brother Sye and shook his hand, laboring along side him; I have had the privilege of chatting with him over the internet with instant message and interactions on Facebook. Lord willing, one day our paths will cross, because we have many of the same friends, and are both out in the world preaching the gospel that saves; the only way to the Father, Jesus Christ the Lord. 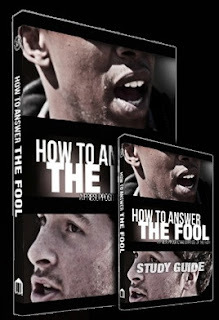 Sye Ten Bruggencate, along with Crown Rights Media, and American Vision Inc. have just released an 85 minute long documentary movie on Sye’s approach to presuppositional apologetics called: “How to Answer the Fool, A presuppositional Defense of the Faith”. I must tell you that this is an excellent work and a must view for anyone who desires to share their faith and glorify Jesus Christ in the world. I was so adamant in Scripture Alone that I would not allow anything else to enter into the argument, I would say, “This is what scripture says” and if anyone said anything contrary to scripture I would say, “That’s not what scripture says”. I have overtime dabbled in this apologetic with the understanding that all men know that there is a God, and an absolute standard of morality, that they suppress their knowledge of Him in their unrighteousness. In other words, they love their sin so much that they suppress their knowledge of Him, and the fact that they are accountable to His absolute moral standard. Now while what I was doing was right, the reason I was doing it was not. In my apologetic, I was sticking to scripture alone, but did not understand fully why I should do that. I knew that the bible says; “The fool has said in his heart, “There is no God.” Now while the bible calls them fools I must admit, prior to seeing this movie, I did not get that. I would even quote it to people, but did not get it. I thought of people who did not profess God as being ignorant, that they needed to be educated, so I would try and educate them, so that they might understand, and if they understood, they would repent, and believe. I now see how ignorant I was, they are not ignorant; they are fools. Sye does a great job explaining this in the movie. A fool is not ignorant, the fool has knowledge. A fool is someone who knows the right thing to do, and knowingly does the wrong thing. The bible calls them fools, and we should not think of them as being ignorant, we should think of them as fools. You answer a fool in a much different way than you answer someone who is ignorant. The word of God says how NOT to answer the fool, and if you do so, you become like him. “Do not answer a fool according to his folly, Or you will also be like him.” (Proverbs 26:4) If he says there is no God, don’t believe him, do not entertain that for even a second, and do not enter into a discussion with him on the validity of Scripture or proof of God, because he already knows these things, regardless of what his mouth may say. While the word of God tells us how NOT to answer the fool, and gives reason for that; in the very next verse scripture also tells us HOW to answer the fool, and gives reason for that as well. “Answer a fool as his folly deserves, That he not be wise in his own eyes.” (Proverbs 26:5) I’m not going to go into “How to Answer the Fool” myself; Sye goes into this in detail during the movie. I highly recommend this movie to anyone who wants to glorify their Lord and Savior Jesus Christ; who has love for their neighbors, and want to see them come to repentance and faith. Everywhere I have mentioned Sye during this blog if you click on his name it will take you to his website: “Proof that God Exist”, and everywhere that I have mentioned the name of the movie, “How to answer the Fool, Crown Rights Media, or American Vision Inc., just click on it and it will take you to the page where you can order the movie. The movie can be ordered electronically for $19.95 and comes with an Electronic workbook, or order a DVD for $24.95 and it comes with a paperback workbook.